Having a Burning Desire is the main principle of Think and Grow Rich so if you get this one right, there is nothing stopping you from accomplishing what ever you want in life! If you can see it in your mind, you can hold it in your hand…. In this section, Hill states numerous times, why you will materialize that for which you have a burning desire. You have to make sure you have a clear mental picture (or physical) and look at it and feel the emotions you would have if you were already there. Do this several times per day to properly ingrain it in your mind! This principle is not about passion, nor motivation, it is solely about that burning desire for what you really want. If you burn your bridges, never retreat you will get everything you can imagine in life. Any obstacle which comes your way, will be just that, a small obstacle along the way! It does not matter what you wish for, this can truly be applied to anything in life but the example given below is linked to money. Fix the exact amount of money you want in your mind! Determine exactly what you intend to give in return for the money. Establish a fixed date for when it shall be yours. Create a plan and start to act on it immediately regardless of whether you are ready or not! Write a concise statement of the exact amount, time limit for it, what you intend to give in exchange and the plan for accomplishing it! Read your written statement twice per day (morning and evening) and when you do, you have to see and feel yourself being in possession of the money already! This part is the most crucial part throughout the whole book!! 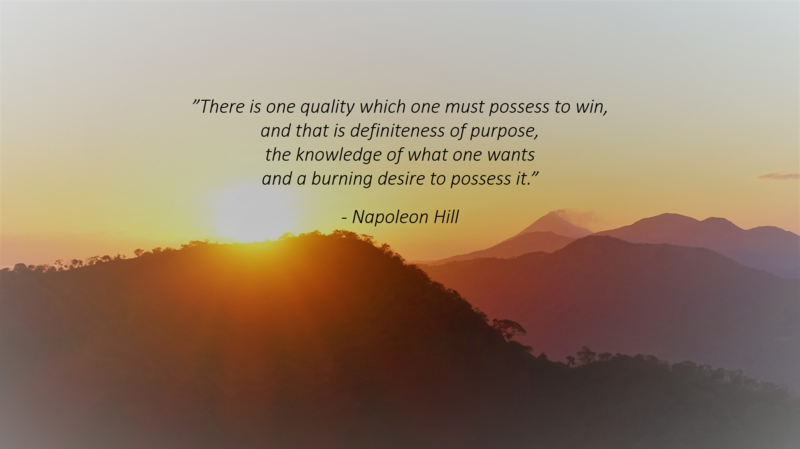 This point really resonates with me as I don’t see how you cannot reach your goal if you truly have a burning desire (obsession) to accomplish that which you want to accomplish. Be sure to use your friends; determination, will, persistence, strategy and focus and I am 100% confident that nothing can stop you! If you have not yet found what your burning desire is, I would recommend you to read my book “Where am I heading”. I will help you reflect on what is truly important to you and what you really want out of life. Another thing I would recommend is for you to read this post on how to find your passion, if you are still trying to figure out what it is. Even if you have a big enough goal, a burning desire, you will also need to have a big enough WHY when the going gets tough which it inevitably will if you aim high! To be honest this has also been my challenge but I am aware of it and that is why I am training myself every day to strengthen my willpower. Check out my blog post on Creating a Winning Mindset to learn more. I know exactly what to do to get me into “beast mode” and then nothing can stop me! How you find that is individual but it is something that you need to have and should be able to draw upon when you really need it. Just by knowing that you can do that at any point, will keep you going. A recommendation here would be to attend an Unleash The Power Within (UPW) event with Tony Robbins as he helps you find that inner strength and how to snap into that mindset in an instance. Hill’s six steps make perfect sense to me because if you don’t know where you are going or how to get there, you never will! Honestly, if you follow those steps you will reach your goals and dreams, period! Just ask yourself this question: is it possible to “fail” if you have a burning desire and always get back up again after every challenge and just keep on going because you know WHY you want to reach that obsessive goal of yours?? I really urge you to get his book and read it over and over again and use a pen to highlight, write in the margins, whatever you need to do in order to properly indulge in all the wisdom. Get the book here! Thanks for this very helpful posting! You’re welcome! Glad you enjoyed it. It truly is an amazing book and we can all, still today, learn so much from Napoleon Hill.